Have you been noticing any slowing performance with your Samsung 840 EVO SSD? Well fret no more: Samsung has a fix for a recently discovered read performance bug called the Performance Restoration Software. The software will return your SSD back to full working order with its original read and write speeds. The restoration tool will essentially run like an automatic program by first loading the SSD with a new firmware, after which users will have to restart their computer. Once rebooted, the drive will go into a three-step restoration process, which will rewrite all the data on your drive. Samsung claims the process won’t wipe your drive, but we would suggest backing up your data to be on the safe side. Currently the tool is only available for Windows. However, Samsung says it is working on a version for OS X and Linux machines. The restoration tool will also not work with 840 EVO SSDs set up in a RAID array, so you’ll need to dissolve a multidrive configuration before running the software. For the last month 840 EVO users have been reporting slow read speed performance with Samsung’s most popular SSD. The sluggish issue seems to stem from the drive falsely identifying corrupted read points. This problem invariably caused the SSD to repeat the read process multiple times and thus slowed the drive’s performance. AnandTech goes into a deeper detail about the issue. Even if you’re not experiencing any noticeable read performance issues, if you own an 840 EVO SSD, check out this software fix. 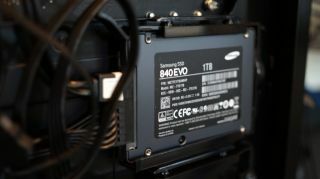 According to Anandtech, there have been a few reports that the bug also affects regular 840 and OEM drives, so hopefully the Samsung can come up with a solution to squash the problem across its entire SSD line.